Va Franklin Delano Roosevelt (30 Jerrey Geuree, 1882 - 12 Averil, 1945) ny FDR ny 32oo Eaghtyrane ny Steatyn Unnaneysit veih 1933 derrey 1945. V'eh reiht kiare keayrtyn gys yn oik as t'eh yn un Eaghtyrane lesh ny smoo na daa cheayrt ayns shelloo oik yn eaghtyraneys. V'eh nane jeh ny fir toshee smoo scanshoil rish geyre-ghaue argidoil ny cruinney as rish y Nah Chaggey Dowanagh. 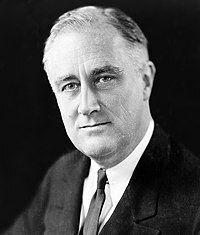 Ta tooilley coadanyn mychione Franklin D. Roosevelt ry-gheddyn ayns Wikimedia Commons.